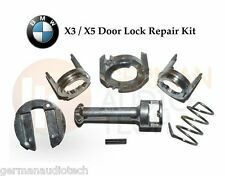 BMW X5 (E53) or X3 (E83) Door Lock Repair Kit. 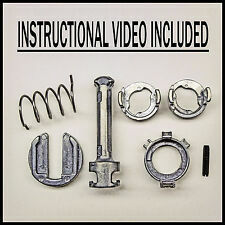 Kit includes all internal lock pieces pictured above. 1999-2006 X5 (3.0I, 4.4I, 4.6I, 4.8IS). Lock Shaft - This shaft has a "cross" shaped top. This cross fits into the actuator within the door and signals the vehicle to unlock the door when turned. COMPLETE BMW E53 DOOR LOCK REPAIR KIT. Compatible with the Following : 1999 - 2006 BMW (E53) X5-Series: 3.0, 4.3, 4.4, 4.6is, 4.8i and X5 M (World-Wide). HIGHEST QUALITY BMW X5 DOOR LOCK REPAIR KIT. 2014 2018 BMW X5. Cash on pickup. All our parts are from Left Hand Drive (LHD) donor vehicles from the USA. All modules and electronics are tested and in working condition. Modules and electronics are not "defective" if you are unable to program into your vehicle. Loc: lock actuator. This is an OEM BMW used part. No warranty on light bulbs. No labor warranty is provided. X5 2000-2006. Front and Rear. DOOR POWER LOCK MOTOR ELECTRIC. GENUINE BMW & MINI FRONT LEFT AND RIGHT. BUY THE GENUINE BMW PART THAT FITS AND WORKS AS DESIGNED FOR YOUR VEHICLE. THIS ITEM IS NEW, IN THE ORIGINAL BOX, NEVER BEEN USED OR INSTALLED. Loc: BMW lock act. This is an OEM BMW used part. No warranty on light bulbs. No labor warranty is provided. Model: BMW X5. Front Door Latch. In order to keep costs as low as possible for you, we don't currently have a call line staffed. Part Grade Abbreviations. cc = Credit Card size units. C = Greater than 200k miles. 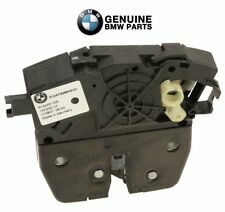 BMW BM5121-8402-537 BM5121-8402-537 1. It is very important that you discuss with experts before you make any decision. Manufacturer provides WARRANTY for the products. We will reply within 24-48 hours. Hi the door handle assembly was removed from a 2010 bmw X6m with 83k miles. Color is Monte Carlo blue metallic. The item is in good working condition. For BMW X5 (E53). 2000-2006 X5 (3.0I, 4.4I, 4.6I, 4.8IS). 2 Keys Included. Left Door Lock Assembly. The lock is attached to your vehicle with just one screw and its very simple to get to. 2000-2006 BMW E53 X5. 03/2002 BMW X5. Shown in pictures. No warranty on electric parts. All parts are tested before removal from the vehicle! Must be in original condition, or it does not qualify. More suitable. The picture is for display purposes only and we can. If there is anything wrong. Any claims made outside the 48 hours will be refused. All other interstate/regional/country areas will take longer than the respective capital. BMW # 51-23-7-164-798. ORIGINAL BMW PRODUCT. 2000-2006 BMW E53 X5. Front Right Passenger Side Lock Actuator. Shown in pictures. No warranty on electric parts. All parts are tested before removal from the vehicle! Must be in original condition, or it does not qualify. Storage Location: U1411. Manufacturer Part Number: 8402540, 51218402540. WILL FIT 2000-2006 BMW X5 E53 CARS. DONOR VEHICLE: 2001 BMW X5 3.0L. E53 AWD. FRON RIGHT PASSENGER DOOR LOCK ACTUATOR LATCH W/ CABLE. WILL FIT: BMW X5. FROM: X5 2009. Model: BMW X5. Part Grade Abbreviations. cc = Credit Card size units. C = Greater than 200k miles. B = Greater than 60k miles and less than or equal to 200k miles but greater than 15k miles per year. A = Less than or equal to 60k miles, or greater than 60k miles but less than or equal to 200k miles and less than or equal to 15k miles per year. Includes Latch. E70 2007-2008 X5 3.0si. E70 2007-2008 X5 4.8i. E71 2008-2009 X6 xDrive 35i thru February 2009. E71 2008-2009 X6 xDrive 50i thru February 2009. E70 2009-2009 X5 x.DrivE30i thru February 2009. Trending at $142.94eBay determines this price through a machine learned model of the product's sale prices within the last 90 days. DONOR VEHICLE :2013 BMW X5 50i XDrive N63 AUTO SPORT WITH 61000 MILES. BMW X5 35dX 2010 ,2011 ,2012 ,2013. BMW X5 35iX 2009 ,2010 ,2011 ,2012 ,2013. BMW X5 4.8i 2009 ,2010. BMW X5 50iX 2010 ,2011 ,2012 ,2013. 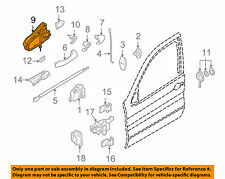 BMW Part # 51217202143. 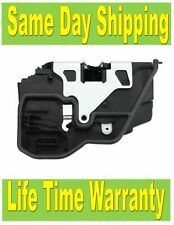 NEW GENUINE Front Left Driver Door Power Motor Lock Latch Actuator for BMW 5 6 7 X5 X6. E71 2008-02/09 X6 xDrive 35i thru 02/09. E71 2008-02/09 X6 xDrive 50i thru 02/09. E70 2007-2008 X5 4.8i. Part Grade: A 19k. Model: BMW X5. Part Grade Abbreviations. cc = Credit Card size units. C = Greater than 200k miles. B = Greater than 60k miles and less than or equal to 200k miles but greater than 15k miles per year. 2008 BMW X5 4.8i. We will do our best to resolve any issues. Be sure for what you buy! - it is an electronic part in good condition. - don’t need it any more;. - wrong part ordered;. - doesn’t fit;. BMW X5 door latch. Driver front. Left front. Includes exterior cable. This Door Lock Actuator is for the Front Right side = Front Passenger Door. 2000 - 2006 BMW X5. Note to Fed Ex Overnight Services: These are available to most Zip Codes at shown rates! Part Number: 51 21 8 402 540. Front Right Passenger Door Lock Latch 51217281948 51207419840 Bmw X5 X6 M F15 F16 F85 F86 2014-17; Rh . 2012 BMW X5 E70 LCI xDrive50i. Front Hood Lock Latch Catch Right Passenger Side. We recycle OEM parts. 2001-2006 BMW E46 M3 / 3 SERIES / E53 X5 / E52 Z8 UPPER HOOD LOCK PAIR OEM. Z8 E52 (12/1998 — 07/2003). X5 E53 (10/1998 — 09/2006). 3' E46 (04/1997 — 08/2006). IMPORTANT FOR US. Item may show signs of wear, light scuffs, scratches or other imperfections as a result of this being a used part. Cable to Hood Locks. BMW # 51 23 7 184 456. ORIGINAL BMW PRODUCT. BMW featured the X5 for model year 1999. This mid-size SUV has continued through three generations as it moves into the 2018 model year. Areas of this vehicle that are in constant use, such as BMW X5 locks and hardware, require routine maintenance. Why doesn't the BMW X5's release lever open the hood? If the BMW X5 hood sticks when you try to open it with the interior release lever, you may have a few issues. It could be the X5 SUV's hood release cable. If the vehicle's hood comes up part of the way but still won't open, there's a possibility that the latch itself has malfunctioned on your BMW. What does the BMW X5 door lock actuator do? Your BMW's lock actuator is an electronic motor located just inside the door. It controls the BMW X5's lock button. The actuator device includes the vehicle's lock motor, cables that connect it to the locking mechanism, and the gears. What are the signs that the X5 actuator needs replacing? There are a few telltale signs that your BMW will reveal when it's time to service the lock actuator. One that stands out is the loud noise you can hear when you try to operate the BMW's motor. The locks moving up and down in quick succession is another. Finally, if the SUV's lock motor has completely gone out, you will be required to use the key to operate the BMW's lock. What does the BMW X5 lock cylinder do? There are a series of tumblers inside the BMW X5's locking mechanism. They are designed to match the ridges in the key. The locking cylinders are installed in the driver and front passenger doors of your BMW, and the key won't fit inside the lock if the tumblers in the cylinder have fallen out of place. You will notice that it takes some force to use the key in the vehicle's lock. Another symptom that the key and cylinder tumblers aren't properly aligning is the BMW's key not being able to turn once inserted. One of the most significant signs is the key actually getting stuck in the BMW X5's lock. What is the purpose of the relay in the BMW? The lock relay in your BMW X5 relays the information to the vehicle's actuators that allow them to function. When the wiring of the BMW's relay isn't properly connected or is shorting, it won't send the proper information to the actuator. As a result, you will notice that the locks either don't work or only work part of the time. The key will still operate in the lock, but the BMW X5's electronic system needs attention.